I’m not talking about the cosmetics of older camper vans. We can deal with paint chips and worn carpeting. I’m talking about the comfort of travelling over a vast distance in a short time. We drove to Silverton (Outback NSW) and back to Sydney in a campervan that sported worn out shocks, worn out seats, and no cruise control. The manual transmission was clearly abused. It was quite a work out to shift into second gear. We put towels and card board in the windows to try to prevent the incessant rattling. Our jaws clenched as every bump launched a new round of chatter; we’ll need serious dental work to smooth out the rough edges of our teeth. By the time we got to Broken Hill, we were so beaten up and saddle sore we went looking for the rental agency to trade in the beast for an upgrade. No such luck… We were stuck with the “Mighty Rattler”. So, leverage the lessons learned from our experience. 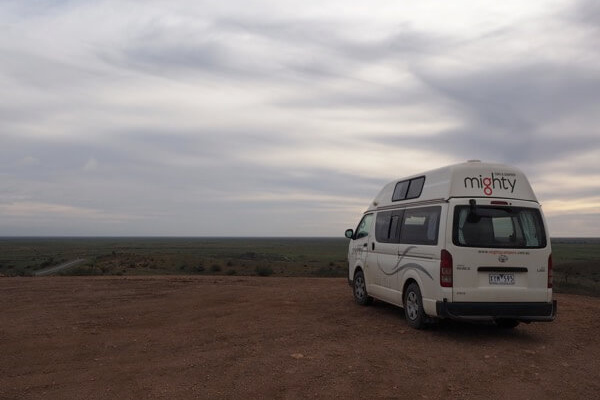 Here are our tips for hiring a campervan in Australia. Check every single appliance to make sure it works. Check the stove, the fridge, the microwave. Understand how to turn on the gas cylinder and how to hook up the electricity and fill the water tank. Know how the outlets work inside. Get instructions on putting the bed and table together. Understand what works and what doesn’t when running solely on auxiliary battery power (when free camping for instance). Know how long you can go on the auxiliary battery without a charge. Understand the ‘on road’ assistance and what happens if something breaks along the way. We had our electric outlet cover snap off. We found a caravan repair/parts store in Dubbo who happened to have the part. $10 later, we replaced it and were on our way. Mighty reimbursed us when we presented the receipt upon the campervan return. Know what kind of fuel you should be using (i.e.. diesel, E-10, unleaded). If you can select returning with an empty gas cylinder, do it! We priced it out and found it’s actually cheaper to do this with the campervan companies. Think very carefully about pre-paying for petrol. We overpaid by almost $20 for the convenience and by believing we were getting a “deal”. If it’s winter, an extra blanket. The provided ‘doona’ is rather lightweight. Extra towels, because if it’s raining, your towels will not dry out quickly. Paper towels. They are invaluable for clean-up. Toilet Paper. You never know what the rest areas along the way will have. Extra dish soap for washing up. You’re provided with two small packets at best. Bring some Febreeze! Between wet shoes, wet towels, the van will quickly start to smell like a locker room. Even if you can air it out, having Febreeze will keep it fresh. The campervan companies recommend ‘soft bags’ and you need to take this seriously. There is nowhere – and I mean nowhere – to put hard suitcases. Keep your grocery bags and use them for garbage bags. Make sure you have easy on/off shoes. You don’t want to track mud/dirt into the campervan. You’ll also want thongs (flip flops) for the communal showers. Ask questions before you give over your credit card! Understand the size of your petrol tank. Get the insurance. 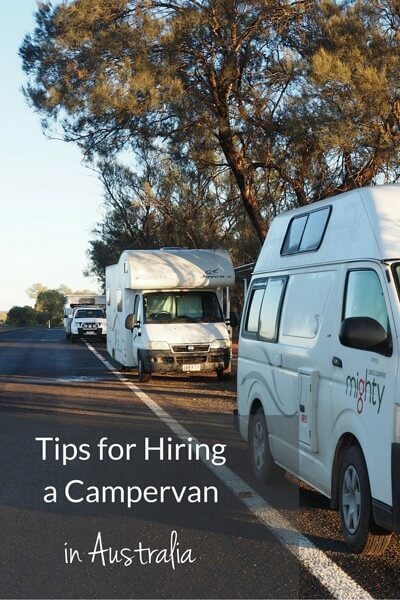 Don’t be frugal on this, especially when hiring a campervan in Australia. There are over 2 million wild goats and goodness knows how many kangaroos roaming around. The road trains just love to throw rocks as well! Don’t hire a HiTop Campervan. Period. it will ruin your fuel economy and the wind will be knocked you around constantly. 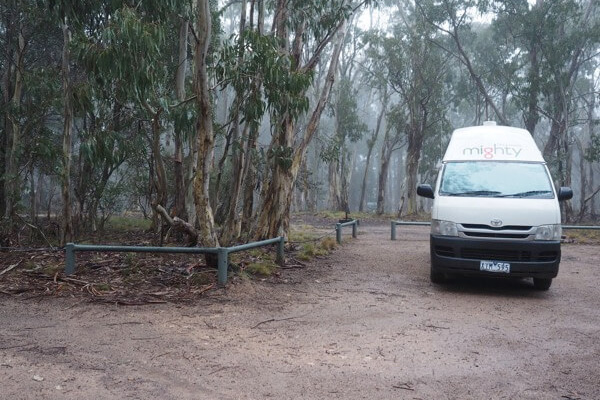 Have you hired a campervan in Australia? What tips do you have? Hope our tips help! Looking forward to hearing how you do! Great tips. We haven’t hired a camper van before but will use this list when we do.